With Here If You Listen, the 77-year-old singer/songwriter continues the singular creative streak, delivering one of his most joyfully adventurous albums yet in a career that spans six auspicious decades. 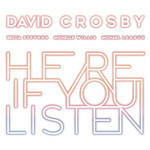 Crosby again joins forces with the three musicians who helped lend his 2016 album Lighthouse its captivating grace: Michael League of Snarky Puppy, Michelle Willis and Becca Stevens (Crosby's "Lighthouse" band). But in a purposeful departure from Lighthouse,Here If You Listen emerges as a highly collaborative effort, with all four artists trading off lead vocals and bringing their distinct songwriting to the mix. With most of the album written collaboratively in League's Brooklyn studio Atlantic Sound, Here If You Listen matches its intricate arrangements with lyrics both raw in emotion and rich in insight. Attuned to the chaos of the present day but visionary in perspective, the songs question, challenge, and demand self-reflection just as often as they illuminate and soothe.